This book investigates cases in which national and international activities have gone massively wrong, entailing seriously negative consequences, and in which the sophisticated analytical models of social science have ceased to be helpful. Illustrations range from the global financial crisis to the failure to achieve speedy systemic change in the Former Soviet Union and the failure to achieve development in the Third World. 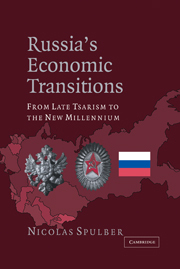 The analysis uses as a backdrop long-term Russian history and short-term Russian encounters with unrestrained capitalism to develop a framework that is based in the so-called new institutionalism. 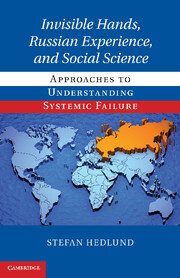 Understanding the causes of systemic failure is shown to require an approach that spans across the increasingly specialized subdisciplines of modern social science. Demonstrating that increasing theoretical sophistication has been bought at the price of a loss of perspective and the need for sensitivity to the role of cultural and historical specificity, the book pleads the case for a new departure in seeking to model the motives for human action. 9. Implications for social science. 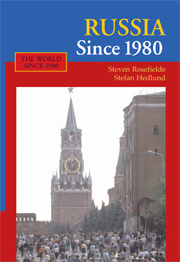 Stefan Hedlund was appointed Professor of Soviet and East European Studies at Uppsala University in 1990. 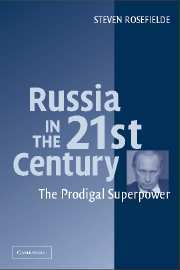 Over the years since then, he has published extensively on the break-up of the Soviet order, attempted Russian reforms and the importance of historical legacies. Professor Hedlund has been a frequent commentator in the media and has traveled and lectured widely, including two sabbatical semesters at Harvard University, as well as briefer stays at the Kennan Institute and George Washington University, Washington, DC, Stanford University and Hokkaido University in Sapporo, Japan. His most recent publications include Russian Path Dependence (2005), Russia Since 1980 (Cambridge University Press, with Steven Rosefielde, 2009) and Authoritarian Market Economy (Chinese edition, 2011).